Following a successful coup against the tyrannical Syndicate, the leaders of the rebel Midway Star System work to forge a government free enough to please its citizens yet strong enough to secure power. But in a world where former rulers have become new foes, an alien threat to humanity may turn old adversaries into uncertain allies. President Gwen Iceni believes Midway is their only defense against the enigmas. Syndicate training taught her self-preservation in a crisis, yet she’s determined to fight for the star system’s fate…even if it means joining forces with another former Syndicate CEO—and an officer of the hated Alliance. Despite General Artur Drakon’s misgivings, he partnered with Iceni to overthrow Syndic forces. Now, with an enigma fleet menacing their hard-earned independence, he can ill afford to trust her—or lose her support. But in the back of his mind, there are three words that describe someone who confides in a Syndicate CEO: Stupid. Betrayed. Dead. 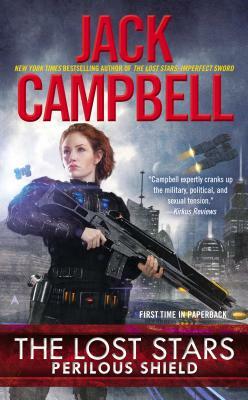 “Jack Campbell” is the pen name of John G. Hemry, a retired naval officer who graduated from the U.S. Naval Academy in Annapolis before serving with the surface fleet and in a variety of other assignments. He is the New York Times bestselling author of The Lost Fleet series as well as the Stark’s War series and the Paul Sinclair series. His short fiction appears frequently in Analog magazine. The Lost Stars series includes Tarnished Knight and Imperfect Sword.